Another one of my cross-border tea haul items! I actually went to Trader Joe’s for the first thing in September and basically was in awe of All The Things – I definitely need to make another trip now that I won’t be (as) overwhelmed by the selection of items. First of my Trader Joe’s tea finds is their Harvest Blend Herbal Tea. It was only $1.99USD, which pretty much sold me on getting it since it was cheap for 20 sachets. Under the cellophane, there’s the cardboard box – and inside of that is a clever resealable wax paper bag with the tea bags inside. The tea bags are square, no string or tag, not really worthy of a photo. However, the aroma from the sachet is very strongly of cinnamon. It reminds me a lot of cinnamon heart candies that are so popular around Valentine’s Day. I can just make out the aroma of orange peel and ginger. 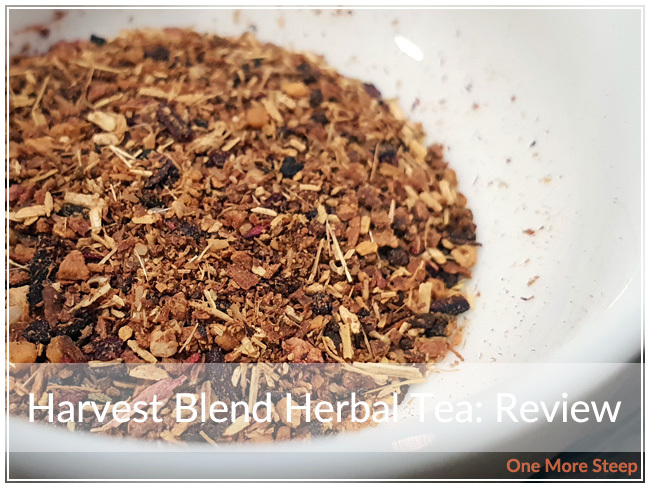 Harvest Blend Herbal Tea consists of: cinnamon, ginger, hibiscus, natural cinnamon and apple flavours with other natural flavours, chamomile, roasted chicory, and orange peel. Trader Joe’s recommendations for Harvest Blend Herbal Tea are to steep in boiling water (100°C/212°F) for 4 to 6 minutes with optional sweetener. My initial steep of Harvest Blend Herbal Tea was for 5 minutes. 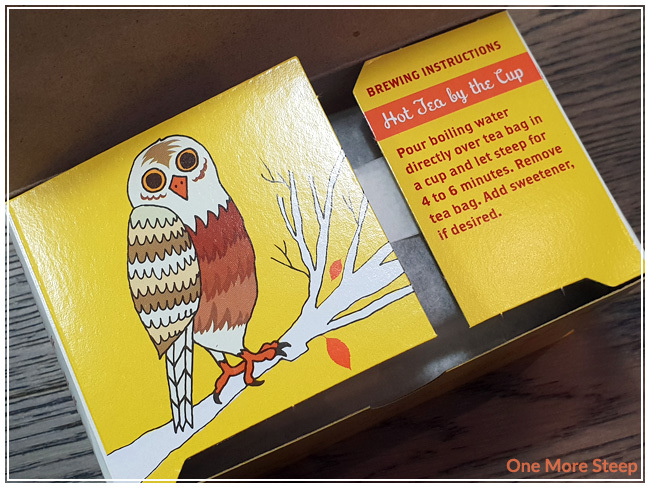 Fun fact, the steeping instructions are on the inside of the box on the flap. Harvest Blend Herbal Tea steeps to a reddish brown that’s a bit murky in colour. 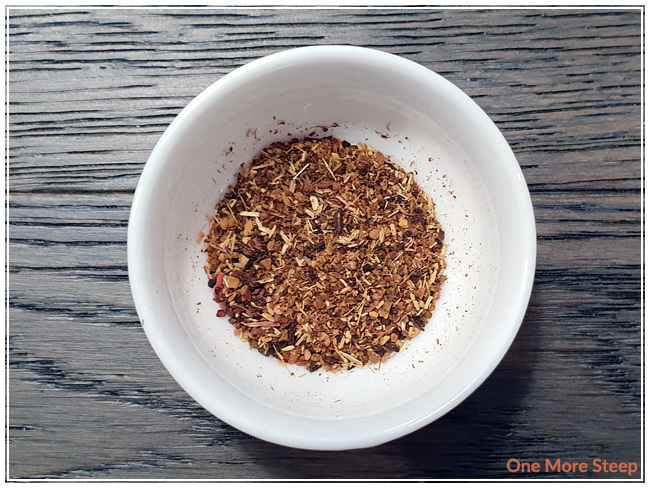 The flavour of the herbal infusion has a nice sweetness to it – I can make out the apple, cinnamon, and ginger flavours. 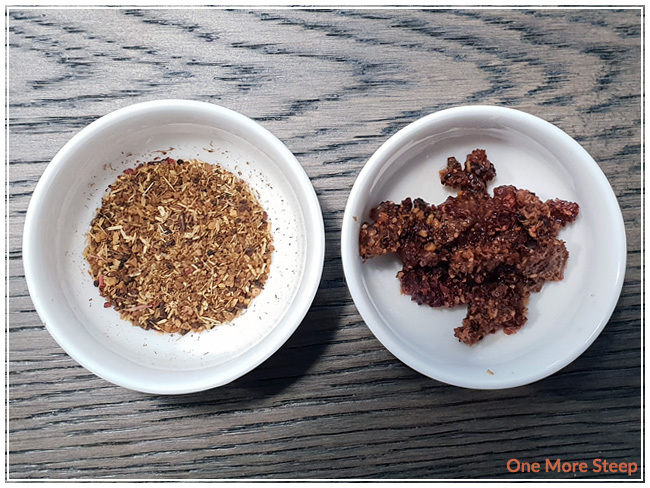 It has a nice balance – there’s a gentle heat from the ginger, but it’s not too much that it’s spicy. I really like the sweetness because I wasn’t really expecting it, and there’s a light tartness from the hibiscus that helps keep it interesting. I attempted to resteep Harvest Blend Herbal Tea and found it to be a weak ghost-like version of the initial steep. I would say that Harvest Blend Herbal Tea is good for just one steep. 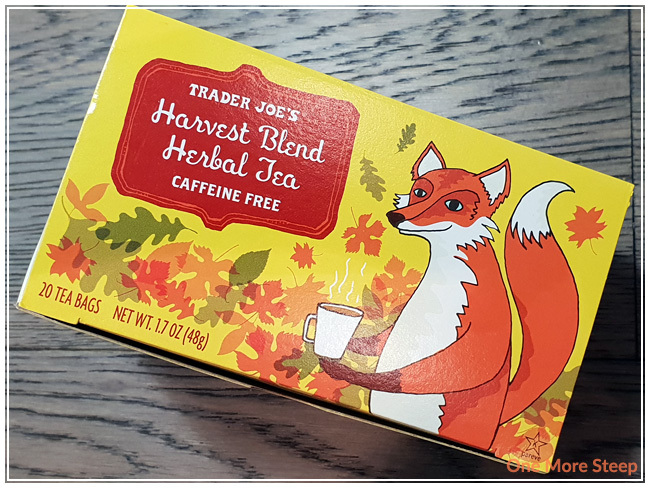 I loved Trader Joe’s Harvest Blend Herbal Tea. 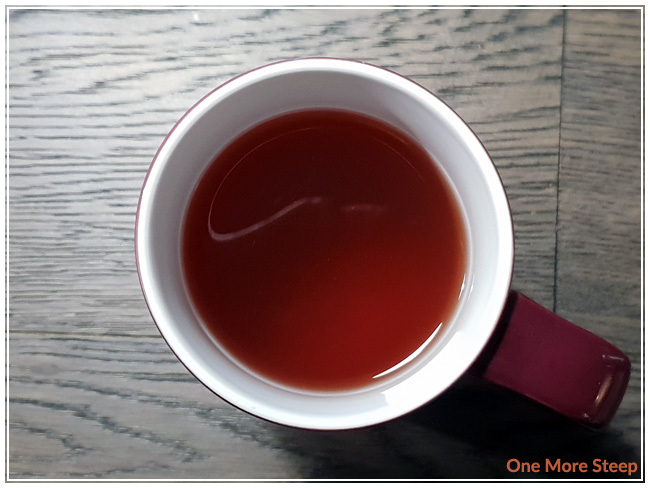 I really enjoyed the flavours in this herbal infusion – it’s really nice to find a seasonal tea that isn’t full of pumpkin or spice (sorry to all the PSL lovers out there…!). I found that the apple flavour was perfect and well-balanced with the ginger and cinnamon. It really made me to think of autumn without being hit in the fact with a pumpkin pie. While I wish that the tea could be resteeped, I’m not to fussed about it since it was such a great price for what will amount to twenty cups of tea. I do think this packaging could do with a little bit of a work, although I do understand that the cellophane is for freshness (and to also prevent product tampering). The resealable wax paper bag is nothing short of genius and I love that the box itself is created with recycled material – almost makes up for the cellophane!